Starting this summer Dory and her friends will be joining Crush in the interactive Turtle Talk with Crush! You will be able to interact with Dory, Destiny the whale shark, Bailey the beluga whale, and the Hank the septopus. You can catch Dory and all of her friends in the movie “Finding Dory” which comes out June 17th. Besides the excitement of seeing Dory for the first time, Squirt, Nemo, and Marlin may drop by as well. 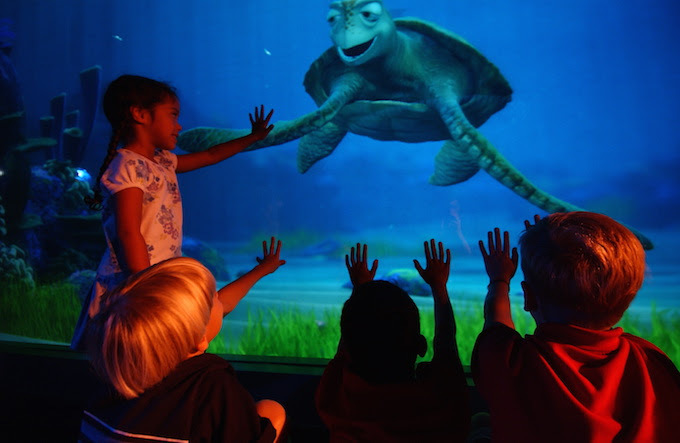 Talk Time with Crush, located in both Epcot and Disneyland California Adventure, is a fun way for the children to chat with their favorite characters from Finding Nemo and Finding Dory. The characters will call your child by name and interact personally with each child. I can’t wait to go find Dory at Epcot this summer! How about you? Comment below!